How far can you go into the woods? As I have managed to get myself ahead with some of my writing projects and, for the first time in weeks, have a weekend where I don’t have anything else planned, I have enjoyed the chance to sit in the warmth of my living room and read. Stephen King, all my creative writing tutors and probably anyone who claims to have any authority on writing will tell you you can’t write without reading. Many writers bemoan not having the time to do both. Well sorry, bubba. You need to make the time. Besides, if you love fiction enough to be wanting to write your own, you will probably find you can’t keep yourself apart from it for long. And it is when you find a book like this with such a simple, intense and captivating narrative that you remember why you do all that you do. I hope I can write stories like this some day. 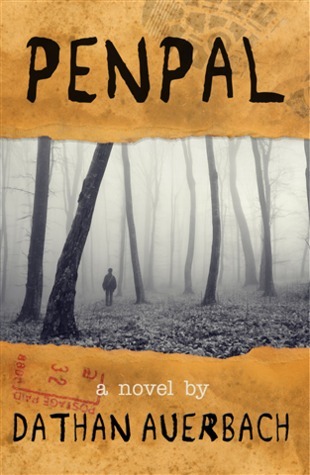 I was recommended Dathan Auerbach‘s Penpal by the writer M. J. Wesolowski after I reviewed his book The Black Land and did an interview with him. He suggested I put this as the very next book on my list to read. I did so, as word-of-mouth recommendation is never to be put aside lightly although, I will admit, not being much of a horror reader and of a somewhat sensitive disposition (this is putting it mildly – the X-Files theme tune alone used to reduce me to a gibbering wreck. Not all that long ago either) I was somewhat wary. But Penpal had me hooked straight away and didn’t let me go until the very last lip-trembling page. I am reviewing it here on my blog in a slightly different way than I have on Goodreads as I think it is worth drawing the book to aspiring writers’ attention because the narrative is so effective in its simplicity. The story itself is someone looking back on a series of disjointed, odd and scary occurrences that happened throughout his childhood when finally armed with knowledge that explains how they were linked. At the time of the events, he had an underlying feel that something wasn’t right, but, as any of us would, especially as a child, he does his best to just bury it and move on, particularly when the occurrences happen whilst disobeying his mother’s orders to stay in the house or to not go too far into the woods. The fear of getting into trouble or getting caught was enough to make us hide many things when young and Auerbach recaptures the mentality of a child in a remarkable way. It took me right back to the way I thought at those ages. It is only much later that the narrator realises the terrible consequences of trying to rationalise and cast aside the significance of the events. But the feeling that something is not quite right is constantly ghosting around behind the narrative like fog. What’s scary about it is that it’s so real. If something tragic, awful and terrifying and completely out of your control were to impinge itself on your childhood, you can imagine it having happened this way. The way you feel like this could very well be your story is what’s so clever, so captivating and so unnerving. This is something aspiring writers should consider: making something so real that it gets into the readers’ skin and blood. No matter what the genre or the intended effect, you make your narrative and characters real, whether it be the story of an intergalactic smuggler with twenty four hours to save the universe, or a six year old boy letting go a balloon with a letter attached as part of a school project with no comprehension of what it will bring back to him, then you will have the reader in the palm of your hand. With Penpal, the way he did it is he kept it simple. Simple is real and real is scary. This entry was posted in Book Reviews and tagged auerbach, book review, creative writing, dathan auerbach, fiction writing, goodreads, horror, horror writing, m j Wesolowski, penpal, penpal review, reading, reddit, review of penpal by dathan auerbach, suspense, suspense writing, The black land, Wesolowski, writing, writing tips. Bookmark the permalink. I’m inspired again! (And a little guilty as I haven’t read a book since I finished Bram Stoker’s “Dracula” a month ago!) Great review and really great advice! Thanks MC! This is a great book for readers and writers alike. I didn’t read it before bed though lol. It was actually originally some isolated posts on a horror forum on Reddit. I read a review on Goodreads that criticised it saying it just seemed like a ‘long Reddit post’. I really didn’t understand where this criticism came from though – good writing is good writing no matter its origin. It felt like novel to me. I guess taste, as always, is the deciding factor. But speak as a reader and a writer i was swept away and inspired by this book. Apologies, it’s been a while since I read this!